A beautifully illustrated tale from R. C. Sproul that teaches children to pray from the Bible. One day Martin Luther's barber asks him how to pray, and his life is changed. 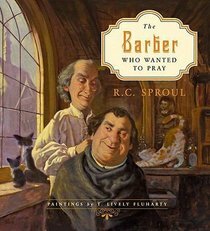 About "The Barber Who Wanted to Pray"
Customer Reviews For "The Barber Who Wanted to Pray"
The Barber Who Wanted To Pray is a beautiful book based on the true account of a barber who happened to have Martin Luther come in for a shave one day, and while there he asked the same question Jesus' disciples had...how do we pray? Not just repeat pre-written prayers, but how do we really pray? Through the ten commandments, the Lord's Prayer and the Apostles Creed as a stepping stone, this book opens the door to meaningful and thankful prayer to our Father. This book is both beautifully written and illustrated and one I'd want to keep beyond the years that children enjoy picture books!